The so-called visual, pictorial or graphic resumes are used since the first creative person decided that he had enough of a unified format which can’t prove to potential employers your creativity, resourcefulness and briefly: ingenuity. Thus was created the first visual resume that later turns into the video resume, website resume, resume powerpoint and keynote templates and so on, depending upon the media used for the presentation. For powerpoint resume templates, check out this article. Details: Light & Dark Background File. 13 Master Pages. PNG Light & Dark Icons. 2 Aspect Ratio (4:3 & 16:9) – 1024×768 and 1280×720. Animated Effects. Download here. This Presentation is the perfect way to introducing yourself for your next job! Try it. Download here. 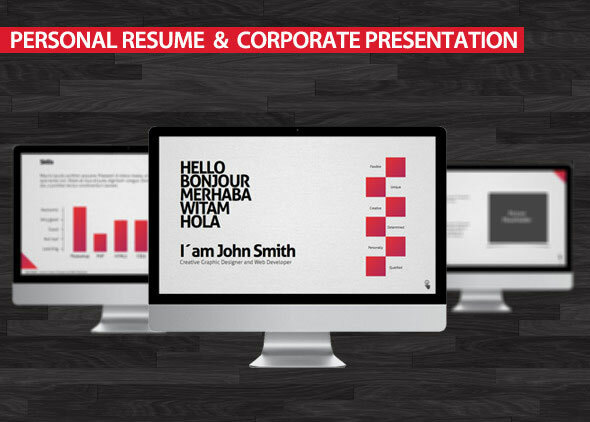 Personal CV – Create your CV as a presentation! Best way to present yourself and your works! General Features: Free Font Used (Google Font- Open Sans Pro ). Fontawsome and Entypo for icons, very easy to use. 6 Different Themes (Including Dark & Light ). Print layout 300 Dpi ready. 40 Uniuqe Slides. 360+ Slides. Easy customizable contents. Retina ready & Full HD. Instruction and Help File included. All icons and content %100 editable. Aspect ratio 16:9. Modern, clean style. Creative & Cool Effects. Download here.